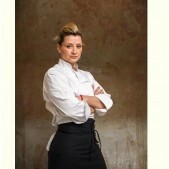 Chef Ivana Raca has already achieved unparalleled success in what has traditionally been a male dominated field. The first female to hold the position of saucier in any of McEwan’s kitchens, Ivana received another promotion making her sous chef on the team that opened ONE Restaurant by the age of 24, Ivana was selected as the first female Executive Chef for the six million dollar food emporium McEwan Foods. Looking for more challenges, in 2012 Ivana traveled to Australia’s Gold Coast where, for two years she worked under Two Star Michelin Chef Paul Froggatt at the Palazzo Versace. Upon her return to Canada, Ivana entered one of the first Underground Chef Battles in Toronto and to no one’s surprise, made it to the final round. Her competitive spirit was most recently on view on the Food Network’s “Beat Bobby Flay”. She is now a proud partner at Ufficio.